Week 6: Happy (almost) Summer Solstice! Happy almost Solstice everyone! With the long days and wet weather we are feeling like we are in a bit of a jungle here on the farm these days. We have a fortress of grass surrounding us on all sides and the weeds are really going for it in any nook and cranny that they can find. We have been diligently fighting back with all our most potent implements of destruction...hoes. But we do have a few other great tricks like the flame weeder (think faranheit 451) and our trusty cultivating tractor, Cherry (although it has been too wet to use her recently). It is also time to trellis tomatoes...or past time. We grow most of our heirloom tomatoes undercover in hoop houses as to bring you the most beautiful tomatoes that can be grown here on the Front Range. It is a time consuming and dirty job to keep up on the trellising, but it is so worth it to have a whole house (or two! ), of tomatoes taller than even loftiest of farmers. This week begins the relentless picking that our farm workers will be doing throughout the duration of the season. It starts with peas, then beans, then cherry tomatoes and goes until first frost (or beyond if we cover stuff). 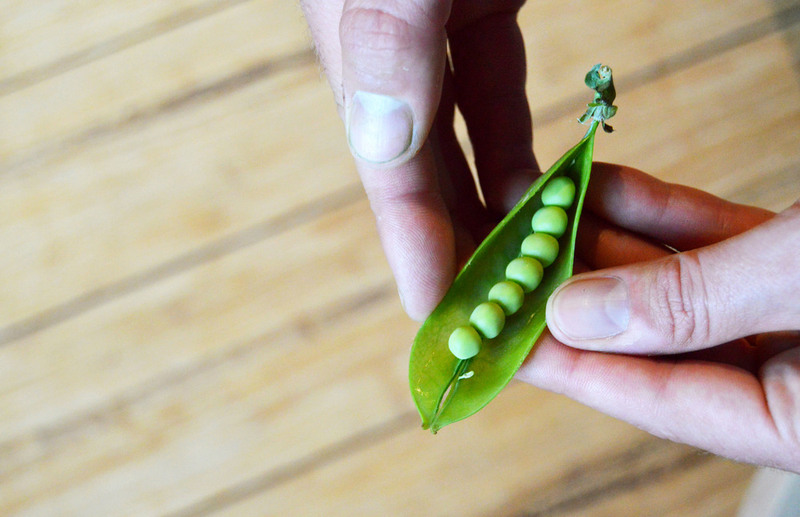 Sugar snap peas are making their debut as the first of the picking crops at the stand and they are just as their name describes, sweet and crunchy. No need to peel these babies, just enjoy them as a lovely snack raw or throw them in a stir fry at the end for a delightful sweet crunch (don't over cook or they will loose their sweet flavor). We will also have the quintessential quick weeknight veggie side this week. Broccoli is back and should stick around for another 3-4 weeks. This versatile cole crop likes cool, wet weather so we only grow it in the spring and the fall. Steam it, saute it, throw it in a quiche, make it into soup, or even roast it with some garlic and parmesan for a nutty side. I can't forget about kohlrabi this week either. Similar in flavor to broccoli, yet a bit sweeter and WAY better raw than its cousin, this optically interesting veggie is great for snacking, slaw making, or soup making. Just peel like a potato and enjoy. This is the last week that there will be no electronic link to your accounts in the email. The website is up and running, but I need to have 5 minutes to get familiar with it. I will have a print out at market for folks who want to check their balances. The kohlrabi skin is not only optically interesting, but also makes for an amazing storage container for the sweet stuff inside. Trim the leaves and put in a plastic bag in your fridge (recognize a theme yet). It will store for over a month like this.